Color Red, Green, Blue etc. Available in Glossy & Matt. Why Opt Us?Automotive Solutions is a company offering high quality UV Clear Coating, catering to the needs of industries looking for UV paints/ coatings. 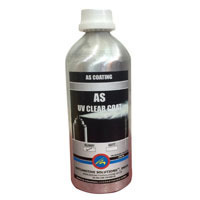 At Automotive Solutions, our innovative UV Clear coatings are designed to give very high refined quality finish. We provide professional services & training of people to apply these coatings. Any Non Bendable product with max A4 Size. We are pleased to introduce Automotive Solutions as a leading company offering complete paint related solutions to Automotive and Industrial Segment and has operations throughout India. We mainly deal in paints and allied products on apply & supply basis and also provide technical assistance for the same. These products are in compliance with international quality standards laid down by Automotive Solutions. We established in the year 2005 as a proprietorship firm and within a short period of time, we have excelled in the field of epoxy flooring, epoxy coating epoxy floor coating and epoxy floor paint. We have grown so far and scaled many heights with our immense contribution. We aim at providing complete customer satisfaction with our outstanding quality, competitive price, and on time delivery.